When running along the ridge line of the Massanutten Mountains, you immediately feel a sense of history. Everything about these mountains are old, from the rocks, to the trees, to the earth that makes up the trails. These are some of the oldest mountains in the world, and as you run up and down them, you can’t help but offer them respect. Respect which they proved worthy of many times over this past weekend. 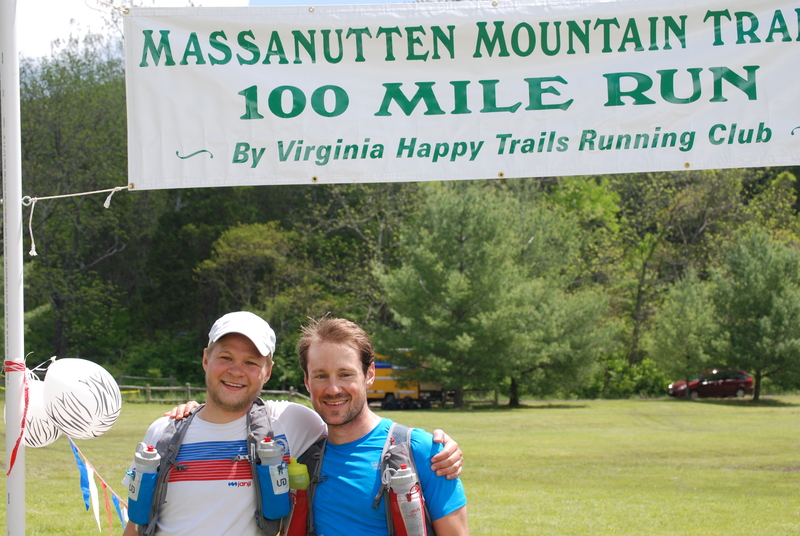 My Massanutten Mountain Trails 100 race report actually begins last Wednesday, 3 days before the race, with an email from my dad. Flash floods. 2-4 inches of rain. Flooding possible…especially along small rivers and streams. The weather would be perfect for race days, with highs in the upper 60s and lows in the upper 30s, but we would be dealing with exceptionally wet and muddy trails, and swollen creeks and rivers. The predictions turned out to be accurate, and by the time I showed up to pick up my bib and attend the pre-race briefing, the rain had stopped and the skies had begun to clear, but many roads were washed out and streams so swollen they actually had to reroute the beginning and end of the course. This was the first sign these ancient mountains would test our patience. After the brief, my wife Katie and I headed back to my mother’s house about 45 minutes away from the start for dinner and a few hours of sleep. My father and step-mother would camp near the start. The four of them would make up my crew, or support group that was allowed to offer assistance, gear, and extra nutrition at many of the aid stations. 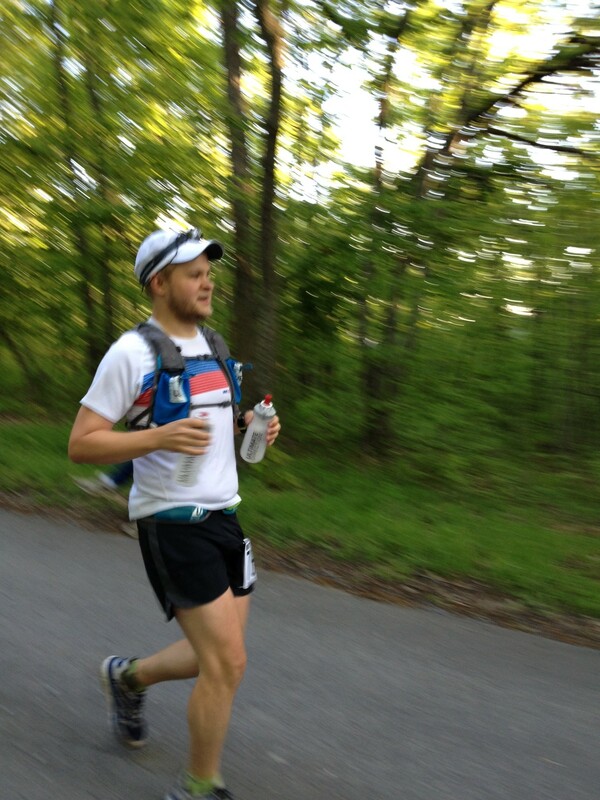 My friend David would be joining at mile 64 to run the rest of the race as my pacer. There was a lot of love for me within that group, and I had a lot of love for them. Something that would prove necessary to get all of us through the weekend. The race began right as the clock hit 4 am, and I took off with about 200 other runners up a gravel road, which made up roughly the first 4 miles of the course. My fresh, dry feet lasted about 2 miles before we waded through a washed out portion of the road, and hit our first mud immediately after hopping on the trail around mile 4. If you hit mile 50 and think you took the first half too slow, you were probably going to fast. As we entered the first trail section, that advice stuck in my head and I claimed a spot behind a long line of other runners, locking in a slow but comfortable pace. We rolled up and down the ridge on slow, rocky terrain, chatting and enjoying the beautiful sunrise over the Virginia mountains. As the birds sang and the leaves twinkled in the early morning sun, I couldn’t help but think of how many days start just like this one in these mountains. So calm. So beautiful. It was the perfect start to this journey, and I couldn’t have been happier to be out there. I rolled into the first major aid station at mile 12 and was greeted by my crew. They were ready with fuel, a change of shoes, and a long list of questions I had prepared for them to ask at each aid station. It was amazing to be greeted by such an exciting group. It would be another 21 miles before I’d see them again, so I stocked up, said my goodbyes, and pushed on. It just so happened I was leaving the aid station at the same time as Gary Knipling, a legend at the MMT100 and the Virginia Happy Trails Running Club. He’s 70 years old, and was going for his 17th finish of the MMT100. Normally I might be a little bummed that I was running at the same pace as someone in their 70s, but this was different. I felt like I had just been blessed by the 100 mile ultra gods, and that now nothing could go wrong. Gary is possibly the nicest man I’ve ever met in the running community. He wanted to talk about me, share his stories, and immediately listed off advice on the course and how I should run a smart first 100. 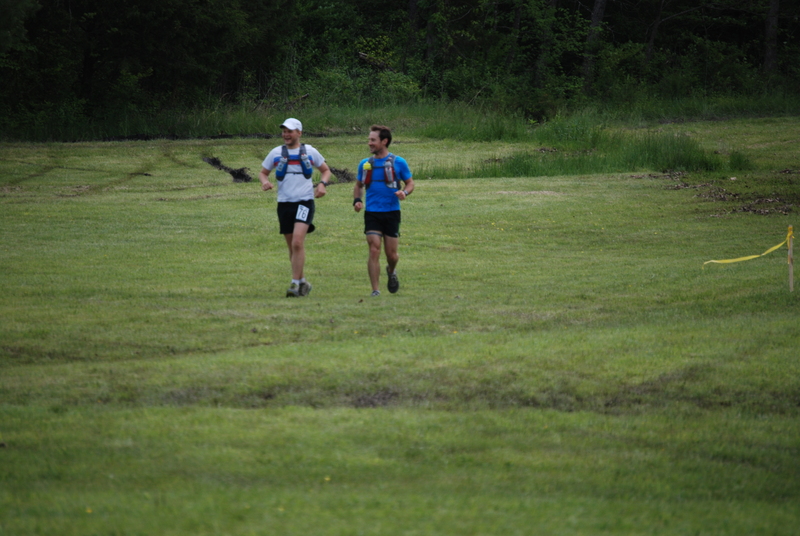 I stuck with him for the next 8 miles until we rolled into Woodstock Tower aid station at mile 20. I’m incredibly grateful for the wisdom he shared and that I got to spend those miles running with Gary. The next 13 miles into the Elizabeth Furnace aid station made up the only section of the course I was really familiar with. I used that knowledge to my advantage, feeling as though I had a one up on the course and terrain, and ran smart on the ridges, attacked a bit on the short gravel road section, and relaxed on the major climbs. What had now turned into a small group I was pacing with, ran into the Aid Station 5 (mile 33) around 12:30 pm. I was feeling great and excited to see my family. 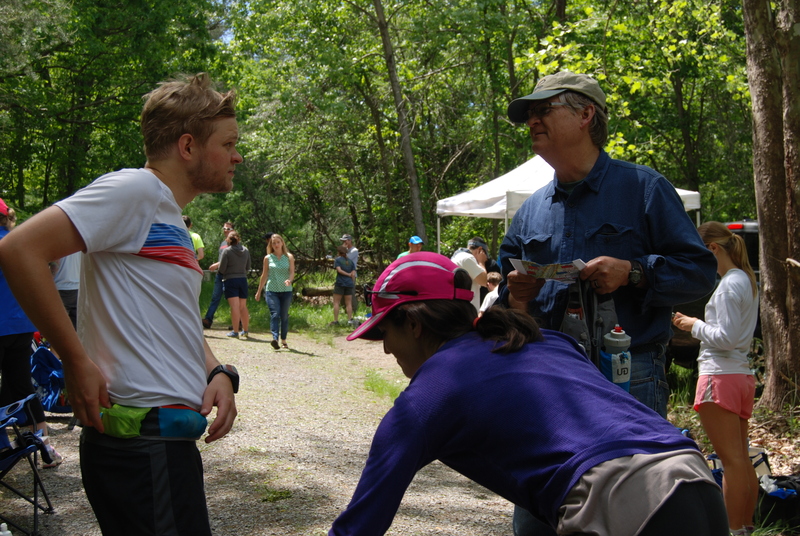 A well run crew is a lot like a NASCAR pitstop, and that’s exactly how I felt at this aid station. They ripped off my shoes and slapped on some new ones, sprayed me down with sunscreen and bug spray, refueled my pack and belt, and sent me on my way. Things started going sour shortly after leaving the Elizabeth Furnace aid station. I think I was having too much fun and focusing on moving at a slow pace for the first 50k, that I wasn’t properly keeping up with my during run fuel. With one major climb followed by a decent decent before I’d see my crew again, I tried not to let my slipping mental game effect me. This worked for awhile, but I left the next aid station feeling low. The miles that followed were one of the lowest points of the race. I struggled big time with a 1,300 foot 3 mile climb to the ridge. The sun was heating things up, I wasn’t as on top of my calorie intake as I would have liked, and 40 miles into the race the thought of another 60 was debilatating. When I finally reached the top of the ridge, I sat down on a rock to gather myself. The climbs and technical terrain, which required tip-toe like running, of this section were demanding my respect. They were winning. I’ve had these critical moments in races and long runs before, only this time I still had over 20 hours of running left to go. Normally I can grit my teeth, focus on a mantra, and power through. Instead I popped a few salt tablets, ate a little food, turned on the iPod and started walking. Over the next several miles of walking and slow running, I would focus on dedicating miles to those that were supporting me. My crew, my wife, my family and friends had helped me get to where I am today. I’ve used this technique many times before, most notably during my first 50 mile ultra, and had it ready for this race. Focusing on others and dedicating the miles allows me to give a bit of purpose to the seemingly unnecessary pain I was feeling. It also serves a much needed distraction. Those tactics worked, and I slowly bounced back over the next 7 or 8 miles down to the aid station at mile 50. Thankfully (and surprisingly), that was the only time I used that strategy to keep me moving forward. 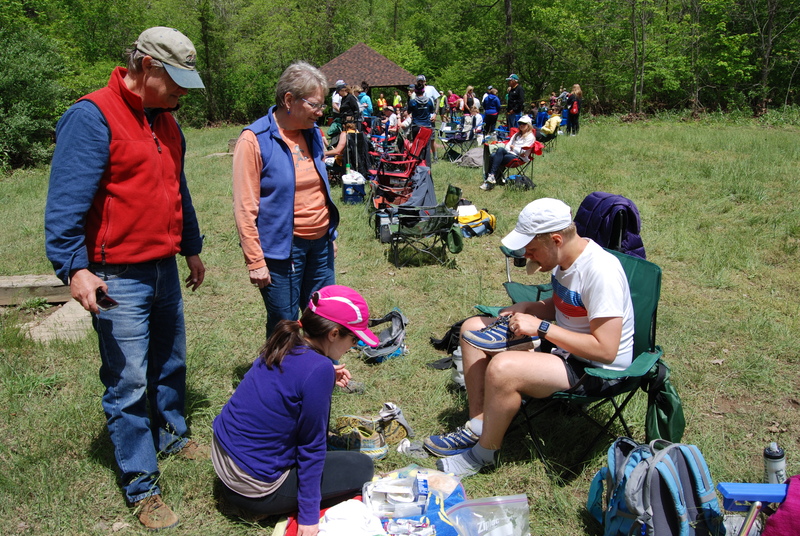 I had one more short push to the Habron Gap aid station at mile 54, where my crew would be eagerly waiting my arrival. By the time I arrived, it was 6:45 pm and I was over an hour off my estimated pace. I didn’t mind being behind schedule, but it meant I had to worry more about the dark and food than I had expected at this point. It also meant that my pacer David was somewhere waiting for me. Probably getting chilled. With the help of my crew, I rushed out of Habron Gap and continued up the largest climb of the day, which started another 9.8 mile section. When it started getting dark just after I made it up on the ridge, I realized that I had just made one of the biggest mistakes I’d make out on the course. I had purposely only asked for my much smaller backup headlamp for this section, thinking it wouldn’t get all that dark before I reached the next aid station. Unfortunately it did. And this rocky, technical section was a real challenge with a dim light. The rocks that line the trails through these mountains are hundreds of thousands of years old. They had proven themselves time and time again, and had no problem testing me who hadn’t taken their challenge seriously. I pushed as quickly as I could, trying to make up time and meet up with David, but the lack of light kept me bouncing slowly along the ridge then back down to Camp Roosevelt at mile 64. The Camp Roosevelt aid station finally came, and my spirits were significantly lifted when I saw the whole crew, including David, who I knew would accompany me for the rest of the race, waiting for me. Katie swapped out my shoes and fed me rice and soup, and I sat and rested for 17 minutes before taking off into what would be the wettest section of the whole course. David jumped right in, encouraging me to continue running all flats and hike aggressively up the trail which had turned into a flowing creek. I was feeling strong and buoyant, especially considering this was the furthest I had ever run, and we made good time on that section. At the aid station around mile 70, my crew convinced me to have a medic look at my blisters. She sat me down, popping what she could and taping up many of my toes. It was painful and I got very chilled as I sat for nearly 30 minutes, but I have no doubt it was the right thing to do. The medic said my toes were the worst she had seen that day, which surprised me as I’m normally looking worse after just 50 miles, but part of me was proud that I wasn’t letting them get me down. I was having stomach issues around this time as well, and couldn’t handle eating much on the run. But by now my mind was about as sharp as a little kid, so Katie used this extra time to trick me into eating more food. “Just one more bite,” she’d say, then another “just one more bite” didn’t seem to phase me. The next 18 miles, taking us through the night, were some of the lowest. As with any race like this, you have your ups and downs, which I most certainly did. But as the temperature dropped through the night and my pace slowed, things started to unravel. Nighttime leaves us the most vulnerable. We’re dependent on manufactured light to help us see, and whatever we have with us to keep us warm and safe. On this night, temperatures dropped quickly during the early morning hours, and neither David nor I had adequately prepared. Another show of strength from the mountains. Another sign of weakness for us. David and I both hit our lowest points of the race around mile 80, when chit-chat had turned to chattering, shivering teeth. It was about 4:00 in the morning, the air had chilled to somewhere in the 30s, and the half asleep/half awake death march proceeded. I was low. I was cold. All I wanted was coffee. Had David not been there with me, I’m convinced I would have laid down on the wet trail for a nap. But eventually we made it to the next aid station. Then the next. And the birds started singing, the sun poked its head over the horizon, and our bodies became more alive with the day. David and I made it to the second to last aid station at mile 87.9 around 7:45 am. We were tired and slow, but still in good spirits. Dad fixed up some oatmeal, we drank a large cup of coffee, and shared stories of the night with the crew. It was nice and comforting. I avoided the fire as to not get too comfortable. Things really turned around for both of us from here on out. About a mile down the trail we commented to each other how amazing our bodies are to recharge and heal so quickly. In a matter of 15 minutes at the aid station, we felt more rested, alive, and fresh. And we were moving accordingly, making up time lost over the night. This portion of the trail proved to be one final show of strength from the mountains. Instead of a steep climb up the ridge, the trail winded slowly along banks and up hills, passing a variety of vegetation before ultimately joining in with the creek bed itself. As we powered up the steep creek bed, with water gushing over our feet, I couldn’t do anything but laugh. David and I quickly refilled and refueled at the final aid station. One more push and it would all be over. It was as we left the final aid station at mile 96.8 that I finally knew I had done it. Nothing was stopping me now. I yelped with excitement and had a short laugh/cry as we took off up the trail. This section has one final climb up the ridge, before winding back down, finally hitting a gravel road right at the 100 mile mark. You then follow that road another 3.7 miles to the finish. The climb and decent are still a complete blur, with my only strong memory being that it felt much longer than it should, but once we hit the road, there was no stopping us. David helped push my tempo, and we made great time down the road. After a few walk breaks, the finish was in sight. We swapped congratulations, bummped fists, and all the stress of the past 32 hours dropped away. I saw my family yelling for me at the finish line. I did it. We did it. It was over. I crossed the line in 32 hours and 22 minutes, over two hours later than I expected. But that didn’t matter. 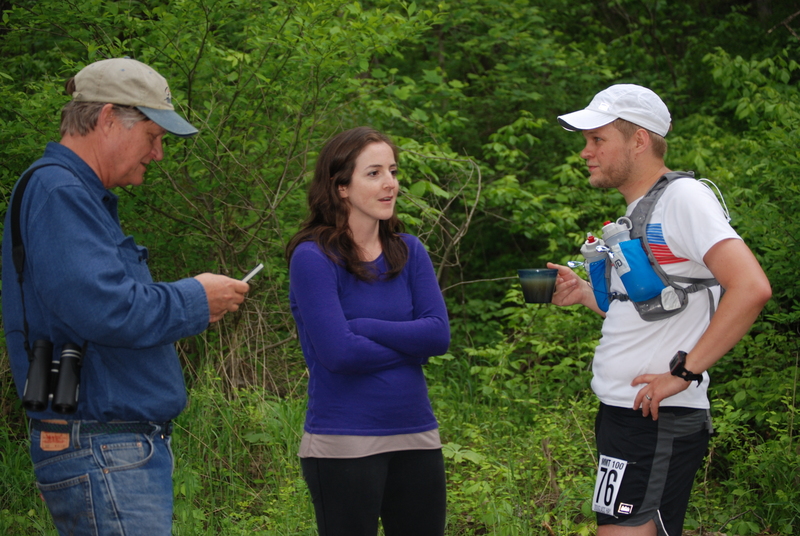 All that mattered was that Kevin, the race director, was there to congratulate me. He even said I looked fresh. I’m sure that was just the adrenaline, as no more than 4 minutes later I couldn’t even keep my eyes open long enough to eat. I’ve had a hard time processing the experience. I had major highs throughout, accompanied by just as many lows. But I never wanted to quit, and I never questioned why I was out there. Over 32 hours is a long time to take for a 100 mile race, many have cut-offs at 30 hours, but this race is different. The technical trails, 18,000 feet of elevation, and bonus miles meant that I knew I’d be out longer than I would on other races. I chose this race as my first 100 in part because of those challenges. Because if I was going to do this, I wanted to do it right. Go all in. And I wanted to pay my respects to the mountains I grew up in. There are few things you work so hard to accomplish and not know for certain until the very end that you’ll succeed. Training was a test of my discipline. Race day was a test of my will. I wasn’t the first to do this, and I certainly wasn’t the fastest, but I’m enormously grateful that I had the strength to push through and complete the goal I was once so terrified to even acknowledge. 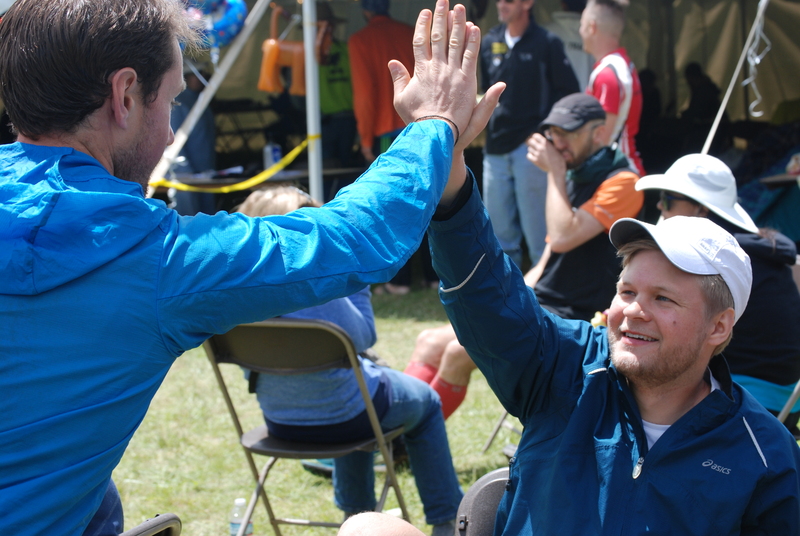 There are major differences between a 100 mile race and shorter ultras. The most major being the logistical preparations and demands from your crew. I seriously couldn’t have done it without the patience and support given so graciously from every member of the crew, and the guidance and strength given from David. They all sacrificed a lot for me to run this race, and I will be forever grateful. I know this report is already increcibly long, but a lot of people have been asking about the details on what I ate and the gear I used. Below I’ve provided details on all that jazz. If that kind of thing doesn’t interest you, no need to keep reading, you might fall asleep. If it does, I hope this helps as you prepare for an ultramaraton. Below I’ve provided a list of everything I ate during the race. Some of the numbers are not completely accurate, but it’ll give you a general idea of what I was taking in. Towards the beginning of the race, I consumed much more of the “energy” foods like gels and bars. Towards then end I was eating more of the “real” foods. Heed x 10 bottles: Great source of calories in liquid form. Nuun ENERGY x 8 bottles: Perfect blend of electorates with added caffeine. Coffee: At 3 separate aid stations. Water: I always had one bottle of Heed or Nuun and one bottle of water. Coconut Water: Drank mostly towards the end of the race at aid stations. Ginger Ale: Taken at two separate aid stations towards the end of the race. 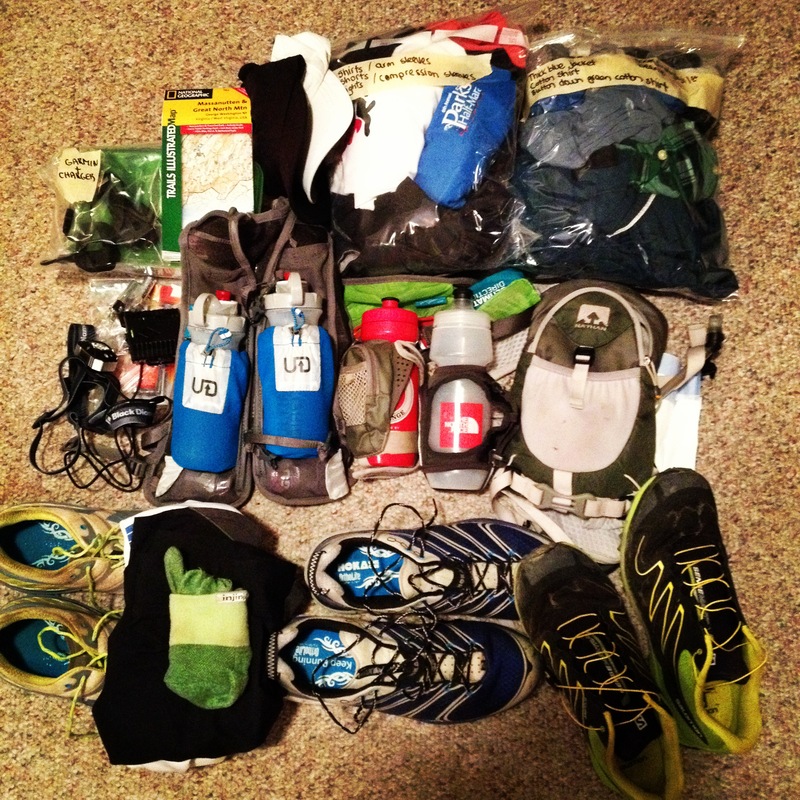 This is the gear I actually carried and used. You can see a full list of everything I packed here, but you’ll notice that much of it went unused. CONGRATULATIONS!!!!! !Thank you so much for the report. Congrats to your wife, family, and crew too. Also to David. A tremendous team effort!!! Congrats! I have really appreciated reading about your journey and have identified with your fear going into the race. Not many other bloggers are honest about the fear that I also have. So reading about your preparation has been inspiring. Can I ask about the salt tabs – which brand and why did you take them? I have been having stomach issues – not digesting what I consume – and I’m wondering if salt tabs would help. Great report!!! Thanks for the detailed write up. And most important, congrats! What a great accomplishment… Semper Fi! Good run Douglass. 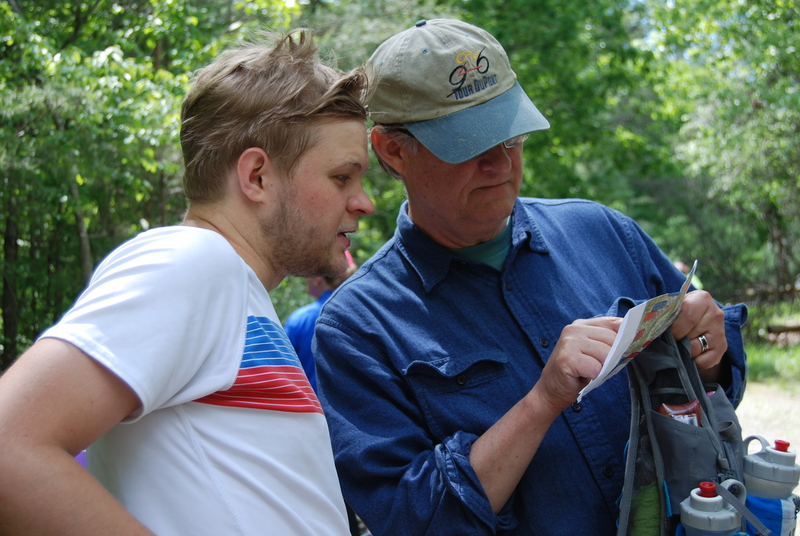 I enjoyed reading your experiences on the Massanutten Mountain. That was a monumental experience. Nice work on your finish on the MMT! It’s a tough tough course!! Doug, this is amazing. Congratulations! You did an amazing job. Thanks for chronicling all your efforts. Congrats on a great finish, and on a great race report. The night was tough for me, too. Long and dark and slow. Pushing through and being rewarded with a handshake from Kevin, and a big hug from my super supportive (and non-running) wife, was well worth it. Keep up the great work, and recover well. You’ve earned it. Thanks for the info, Jeff. I did take one Advil somewhere around mile 70. I’ve heard that ibuprofen isn’t the best option, but I hadn’t done much research into it. Thanks for the warning. I’ll carry Tylenol from now on! Your reflection reinforced the importance of having a good pacer on any race; David sounds like a true savior. Do pacers have to pay to participate in a portion of the race? Hey Richie, David was a true savior! I’ve never heard of pacers have to pay to participate. They do have to follow set rules outlined by the race, so be sure to check those, and often have to register with the race when they arrive on race day, but not pay.